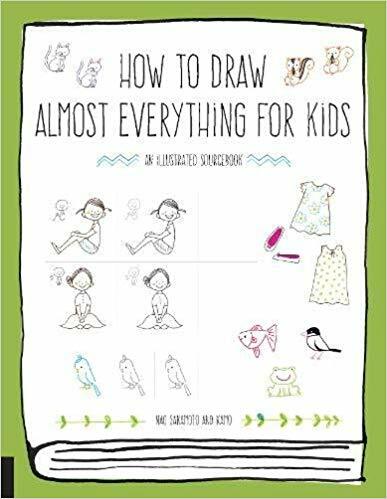 With How to Draw Almost Everything for Kids: An Illustrated Sourcebook, Nao Sakamoto and Kamo provide help for beginning artists. Whether you’re a kid or adult and want to doodle or cartoon, this book has useful info. The book begins with an explanation how to use the book and the different types of ball pens, line thickness, color, etc. The book is then divided into sections that cover drawing people, animals, plants, food, everyday objects, icons, and seasonal and special event drawings that can be used on greeting cards and the like. Each section starts with a brief explanation and hints to help the artist. For example, at the start of the People section, there is a six-step explanation with illustrations of how to draw a face. There is another instructional section before the tutorial on drawing bodies. While there’s a decent amount of instruction, there’s also less instruction than I think a child or beginning artist might need. I intend to use this book to help a young woman with autism improve her drawing. I’d like to see step-by-step numbered instructions on a few more drawings, but I’ll see how it works out. I think the average adult would not need additional instructions, though. What I really love about this book is the simplicity of the drawings, the practical hints (start with a teardrop for a humanoid body, etc. ), and well-laid-out spaces for looking at an example, tracing that example, and then drawing the example free-hand. In addition, the drawings are unique and quirky in a way that I think will appeal to a large audience, but especially kids. Overall, an enjoyable, helpful, and useful instruction book. Highly recommended. Practice makes perfect and is fun too with tracing and easy steps can teach kids to draw almost everything under the sun. From soccer balls to panda bears and rainbows to racing cars this book not only makes kids feel successful at drawing but is fun for all ages. Rainy days, Sunday mornings, or after school – all kids will enjoy improving their drawing skills with the How to Draw Almost Everything step by step approach.